If you’re a bodybuilder, try taking a good multivitamin to improve your performance. Take it from us: guys from the Golden Era of Bodybuilding took their vitamins. Look at how impressive their performances were. Let’s see if Universal Nutrition Uni-Vite can help you in that regard. We’re hoping this multivitamin can exceed your expectations. Buckle up and enjoy the review, as usual. Good formula. Should help increase athletic performance. Uni-Vite Performance Blend. Helps increase virility and boost long-term health. Not the cleanest multivitamin. Has artificial food colorings and proprietary blends. Other Ingredients: Gelatin, Maltodextrin, Silicon Dioxide, Magnesium Stearate, Titanium Dioxide, FD&C Yellow #5, FD&C Yellow #6. Directions For Uni-Vite: Take 4 capsules daily with food. Up to 8 capsules may be taken daily, 4 each in the AM and PM. If you’re a hard-training athlete or bodybuilding enthusiast, a powerful multivitamin is a great addition to your supplement stack. Try checking out some of the athlete multivitamins we’ve reviewed on B5, folks. Say, you’re trying to decide between JYM Vita JYM or EVLUTION NUTRITION VITAMODE. Both pack a serious wallop. Although we’re giving the former the edge, either of these products will make a difference. On that note, we’re hoping we can mention Universal Nutrition Uni-Vite in the same breath. Listen, we’ve reviewed some Universal Nutrition products before (such as Universal Nutrition Torrent and Universal Nutrition LAVA). While most of them garnered above-average ratings, they have one common denominator. Yep, it has come to a point we expect a Universal Nutrition product to have a filler or two. It’s sad. We’re hoping this trend ends with the company’s signature multivitamin. Universal Nutrition Uni-Vite “is designed specifically for elite strength athletes who need and expect more,” per the manufacturer’s official website. “It is a complete and comprehensive multivitamin supplement packed with over 50 potent ingredients vital for ensuring optimal performance, strength, vitality, and virility,” per the same source. Meet Universal Nutrition’s multivitamin for bodybuilders. There are many multivitamins geared toward athletes which have the same claim. We’re looking for that certain something which will make Universal Nutrition Uni-Vite stand out. Unfortunately, this multivitamin didn’t get off to a good start. You see, the first thing we look for when grading a multivitamin is the “All-Natural” or “ISO-Certified” label. We found none on Universal Nutrition Uni-Vite. The implication: there may be fillers in this multivitamin somewhere. There goes our hope of a dirty-ingredient-free Universal Nutrition product. An “All-Natural” label on your multivitamin will put your mind at ease. We believe this facet is crucial for this bodybuilding product line. Simply put, multivitamins have a ton of ingredients (some, such as Optimum Nutrition OPTI-MEN, have more than 75 ingredients). Having that peace of mind your multivitamin has natural components will save you time and heartache. Believe us. Too bad Universal Nutrition Uni-Vite fell short. One common trend among multivitamins for athletes is their mega doses of B vitamins for their heart health and energy benefits. This product is no exception. The takeaway: Universal Nutrition Uni-Vite’s 50 milligrams per B vitamin is solid, but the amount clearly pales in comparison to Beverly International Super Pak’s and JYM Vita JYM’s. In fact, Universal Nutrition Uni-Vite’s B vitamin content is 200 percent less than Beverly International Super Pak’s. We can draw two conclusions from this. First, Universal Nutrition Uni-Vite will still give athletes ample amounts of energy and cardiovascular health benefits. We cannot dispute that fact. Second, it won’t be able to dethrone Beverly International Super Pak as the king of B vitamin content among athlete multivitamins. As far as vitamin C content is concerned, Universal Nutrition Uni-Vite is no slouch at an impressive 417 percent daily value for every four capsules. Nonetheless, this multivitamin still lags behind Beverly International Super Pak’s insane 3,333 percent of the daily value for vitamin C.
On the other hand, we’re also particular about several ingredients which some manufacturers leave out. More specifically, we’re talking about Vitamin D, iodine, chromium, and copper. We love the fact Universal Nutrition Uni-Vite has all four. Awesome. Too many people aren’t getting enough sunlight nowadays – that may backfire on your cardiovascular and bone health in the future. That’s why it’s imperative your multivitamin should have vitamin D.
For its part, iodine helps regulate thyroid activity and keeps bacterial accumulation in check. On the other hand, chromium plays a key role in insulin function for more muscle growth and fat loss. Finally, some health experts believe copper helps ramp up energy levels and human growth hormone (HGH) levels. If you’re an athlete, why wouldn’t you want those? Here’s the good news: the folks at Universal Nutrition kick things up a notch. Honestly, it’s reminiscent of Optimum Nutrition OPTI-MEN, which has several multivitamin blends geared toward similar goals. 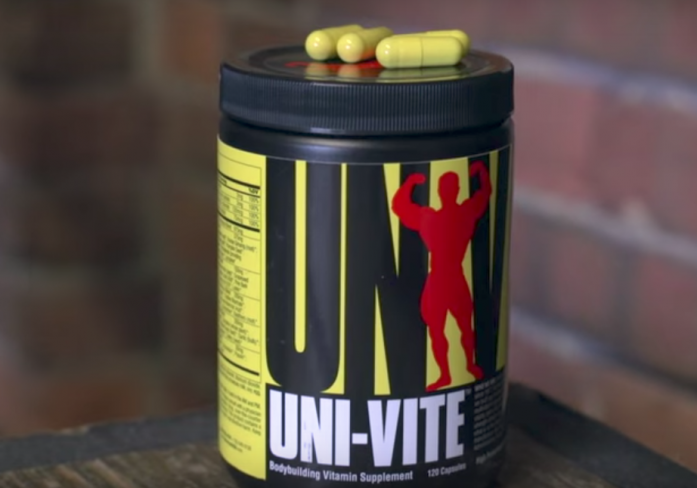 Our impression: Universal Nutrition Uni-Vite’s special blends are well-rounded and thorough. We’re confident they’ll help you attain better long-term health. You can’t argue with quality and time-tested ingredients such as Korean ginseng, Gingko biloba, Coenzyme Q10, lutein, green tea, l-carnitine, l-glutamine, wheat grasss, and garlic. These make for a versatile and healthy athlete. Unfortunately, this manufacturer’s shady reputation doesn’t do this product any justice. The aforementioned blends are also proprietary blends – the company fails miserably to divulge each of the individual components. Plus, we also spotted some fillers in Universal Nutrition Uni-Vite (artificial food colorings FD&C Yellow No. 5 and FD&C Yellow No. 6). Just so you know, these have certain side effects. These could offset the many health benefits we’re talking about. We’ll never know why Universal Nutrition decided to include these to begin with. It just boggles the mind. Vitamin A (as carotenoids [b-carotene, a-carotene]), 5,000 IU: Many fitness enthusiasts know vitamin A is responsible for excellent eye health. Not only that, but it also helps strengthen bones and facilitate the muscle repair process. Vitamin C (as ascorbic acid, ascorbyl palmitate), 250 mg: Universal Nutrition Uni-Vite’s ascorbic acid content (417 percent of the daily value) is at par with the likes of JYM Vita JYM. That much is more than enough to help ward off nasty free radicals, the common cold, and high blood pressure. Vitamin D (as cholecalciferol), 800 IU: We’re sure glad Universal Nutrition Uni-Vite has vitamin D, a component which some multivitamin manufacturers miss out on. This product’s 200 percent of the daily value for vitamin D ensures you improve your heart and bone health, for sure. Vitamin E (as dl-a, d-b, d-y, d-tocopherols and tocotrienols), 100 IU: This vitamin helps regulate metabolism and keep free radicals at bay. Plus, it also helps improve the muscle recovery process – a great plus for all bodybuilders and athletes. Vitamin K (as phytonadione), 40 mcg: Many multivitamin supplement manufacturers also tend to overlook vitamin K. Too bad – it helps ward off blood clots, strengthen bones, and improve heart health. We’re glad Universal Nutrition Uni-Vite has it. Thiamin (as thiamin mononitrate), 50 mg: Also known as vitamin B1, this component represents an insane 3,333 percent of the daily value in Universal Nutrition Uni-Vite. We’re confident this much will ramp up your energy levels and boost your heart health. It’s not the most among athlete multivitamins, but it’ll get the job done. Riboflavin, 50 mg: Also known as vitamin B2, this component helps regulate cardiovascular, immune, and digestive system health. A whopping 2,941 percent of the daily value for riboflavin is a sure bet, folks. Niacin (as niacinamide), 50 mg: Simply known as vitamin B3, this ingredient helps improve cardiovascular health and joint mobility. We said it before, we’ll say it again: take extra caution, folks. This B vitamin may cause “niacin flushing” (a tingling sensation in the face and chest regions). Vitamin B6 (as pyridoxine hydrochloride), 50 mg: A B vitamin which helps regulate homocysteine levels for better heart health. Pyridoxine hydrochloride also helps regulate sleep cycles for faster recovery. An incredible 2,500 percent of the daily value for vitamin B6 should help you in these areas. Folic acid, 400 mcg: This is vitamin B9, which helps boost cardiovascular health and regulate cholesterol levels. Vitamin B12 (as cyanocobalamin, methylcobalamin), 50 mcg: Some multivitamins feature vitamin B12 as their main ingredients. Not this one. Nonetheless, Universal Nutrition Uni-Vite’s 833 percent of the daily value for vitamin B12 will help athletes improve their cardiovascular health and increase their energy levels. Biotin, 100 mcg: Simply known as vitamin B7, this component is known for its benefits for the hair, skin, and nails. However, biotin also helps build muscle tissue and keep inflammation at bay. Good stuff. Pantothenic acid (as d-ca pantothenate), 50 mg: This component is also known as vitamin B5. It helps ramp up endurance and stamina. It also helps regulate the immune system. Tremendous benefits for athletes everywhere. Calcium (as ca carbonate), 100 mg: Many multivitamins have insignificant calcium levels. Universal Nutrition Uni-Vite’s 20 percent of the daily value isn’t astronomical by any means, but it will help regulate blood pressure levels and improve bone and teeth health. Iodine (from kelp). 120 mcg: An ingredient which helps regulate thyroid function, keep bacterial growth in check, ward off free radicals, and improve immune system health. Magnesium (as mg oxide), 75 mg: A mineral which helps improve heart health and strengthen bones and muscles. Zinc (as zn oxide), 15 mg: A mineral which helps maintain healthy blood sugar levels, boost weight loss, and ward off nasty free radicals. Selenium (selenomethionine), 70 mcg: This is a trace mineral which helps improve thyroid and immune system function. Plus, some fitness experts believe selenium helps ramp up muscular strength. Awesome. Copper (chelate), 2 mg: A mineral which helps increase energy levels and human growth hormone (HGH) levels. One hundred percent of the daily value should go a long way, folks. Manganese (as mn sulfate), 2 mg: We believe this mineral – which helps increase testosterone levels (for increased strength and muscle mass) and form connective tissue – is a great insurance policy in Universal Nutrition Uni-Vite. Trust us. Chromium (as cr chloride), 120 mcg: A mineral which helps regulate insulin sensitivity for increased muscle growth and fat loss – two great benefits for athletes. Molybdenum (chelate), 75 mcg: An ingredient which helps increase energy levels, facilitate waste processing in the kidneys, and ward off free radicals. Stinging nettle (root): A flowering plant which helps boost prostate, urinary, and joint health. Korean ginseng (root): An adaptogen which helps lower cholesterol levels, reduce stress, increase energy levels, and boost memory. Gingko biloba (leaf): An ingredient which helps improve memory and cell nutrient uptake, boost circulation, and ward off free radicals. Pumpkin seed: Great source of Vitamin A for excellent eyesight. Pumpkin seeds also help regulate cholesterol levels and improve cardiovascular health. L-arginine: An amino acid known in bodybuilding lore as a potent vasodilator for improved blood flow, healthier blood pressure levels, better nutrient uptake, and increased muscle pumps. Some health experts believe l-arginine also helps increase virility and improve sexual function. ß-sitosterol (soy): Beta-sitosterol is a plant-based ingredient which helps regulate cholesterol levels and boost heart health. In terms of sexual function, it helps improve prostate health. Lycopene: A powerful antioxidant which helps keep free radicals at bay. It also helps improve heart, eye, and brain health. Citrus bioflavonoids (peel): These help enhance vitamin C’s benefits. Citrus bioflavonoids also help boost circulation and ward off nasty free radicals. Grapeseed extract: A rich source of polyphenols which help keep free radicals and inflammation at bay, maintain healthy blood pressure levels, and boost cardiovascular health. Alpha lipoic acid: An antioxidant which helps convert glucose (sugar) into energy. It also helps regulate vitamin levels in the body. Pine bark extract: This component helps boost the circulatory and cardiovascular systems. It also helps ward off inflammation and improve heart health. Coenzyme Q10: A substance which helps shore up heart health, increase stamina, and boost cognitive function. Lutein: A phytonutrient which helps filter out excessive ultraviolet rays from the eyes. Lutein also helps regulate skin, tissue, blood, and immune system health. Green tea (leaf): Helps ramp up fat loss, boost heart health, and ward off free radicals. Choline bitartrate: A popular nootropic which helps improves memory and learning. Inositol: A molecule which helps metabolize fats and cholesterol for a healthier heart. Para-aminobenzoic acid: Simply known as PABA, this organic compound helps boost skin, hair, and intestinal health. L-carintine: An amino acid which is popular for its fat-burning prowess. L-carnitine also helps increase muscle mass, endurance, strength, and stamina. L-glutamine: An amino acid which helps improve gut health, increase muscle mass, improve athletic performance, boost metabolism, and ward off free radicals. Eleuthero (root): An adaptogen which helps increase energy and focus. It also helps lower anxiety levels, regulate sleep patterns, and keep fatigue at bay. Alfalfa (herb): Helps lower cholesterol levels, ward off free radicals, keep inflammation at bay, regulate blood sugar levels, and improve digestion. Spirulina (whole plant): A superfood which is rich in protein, potassium, iron, and calcium for good, long-term health. Chlorella: Helps regulate the immune system, boost weight loss, and regulate blood sugar and cholesterol levels. It also helps keep free radicals at bay. Wheatgrass (leaf): A superfood which is teeming with vitamin A, vitamin C, potassium, calcium, magnesium, and sodium. Its chlorophyll content helps alkalize the blood for improved health. Garlic (bulb): Helps regulate blood pressure and blood sugar levels, boost the immune system, ward off free radicals, and boost weight loss. Flaxseed (powder): Great source of healthy fats and omega fatty acids for improved cardiovascular health. Flaxseed also helps keep free radicals at bay. Celery: Vegetable which helps regulate blood sugar and blood pressure levels. Ginger root: Helps ward off inflammation, boost immunity, ramp up weight loss, and improve digestion. Bromelain: A digestive enzyme derived from pineapple which helps break down protein. It also helps ward off inflammation and maintain healthy blood sugar levels. Papain: As the name suggests, this is a by-product of the papaya fruit which helps boost protein digestion. Lipase: A digestive enzyme crucial for the breakdown of fats. Inulin: A water-soluble fiber which helps ward off constipation. It also helps improve heart, bone, and colon health. You’ve seen the formula. We’ve laid out the facts. We’re confident this multivitamin will help improve athletic performance, virility, overall health, and then some. Long story short, Universal Nutrition Uni-Vite will help take your performance to the next level. Is it the best athlete multivitamin in the industry? That distinction belongs to Beverly International Super Pak for now. Nonetheless, Universal Nutrition Uni-Vite is no pushover – it has mega doses of B vitamins which will help shore up heart health and ramp up your energy levels. We also like the inclusion of neglected components such as vitamin D, vitamin K, chromium, and copper. Many multivitamin brands overlook these. Good thing Universal Nutrition Uni-Vite didn’t – these ingredients are vital for long-term health and athletic performance. We also say the Uni-Vite Performance Blend (which takes up 975 milligrams per serving) is as comprehensive as it gets. If there is an athlete who wouldn’t enjoy better virility, increased antioxidant protection, and better overall health, give us a buzz. For all its upsides, Universal Nutrition Uni-Vite has its share of downsides. First, there is a possibility this product has synthetic ingredients. Like we said, we didn’t find any “All-Natural” or “ISO-Certified” label. That could be a potential red flag, folks. Universal Nutrition Uni-Vite also has two artificial food colorings (FD&C Yellow No. 5 and FD&C Yellow No. 6) which have certain side effects. Plus, Universal Nutrition Uni-Vite’s Uni-Vite Performance Blend consists of several shady proprietary blends. Finally, some customers say this multivitamin isn’t as potent as some of the others they’ve tried previously. However, they’re in the minority. The takeaway: if you want an all-natural multivitamin for athletes, Universal Nutrition Uni-Vite covers half of that objective. Simply put, if you’re iffy about synthetic ingredients, better skip this one. We agree with the above claims. 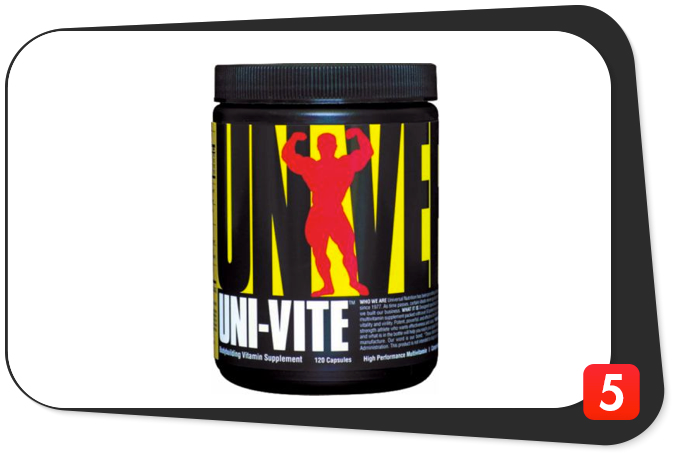 Universal Nutrition Uni-Vite will help athlete and bodybuilders take their performance to the next level. Universal Nutrition Uni-Vite “is designed specifically for elite strength athletes who need and expect more,” per its official website. Universal Nutrition Uni-Vite has FD&C Yellow No. 5 and FD&C Yellow No. 6, two artificial food colorings which have certain side effects. In addition, this multivitamin contains 50 milligrams of niacin (also known as vitamin B3) which is equal to 250 percent of the daily value. This much may result in “niacin flushing” in some individuals. If these, or any other ingredient, make you feel doubtful, please consult your physician before purchasing. Good formula for bodybuilders. Should help increase athletic performance. Mega doses of B vitamins. Help boost heart health and ramp up energy levels. Has vitamin D, vitamin K, chromium, and copper. Components which some competitors overlook. Uni-Vite Performance Blend. Should help increase virility and improve long-term health. Has fillers. No “All-Natural” label plus has FD&C Yellow No. 5 and FD&C Yellow No. 6. Proprietary blends. Uni-Vite Performance Blend’s components have no precise ingredient amounts. Boo. Inconvenience. Consuming four capsules daily may be a chore for busy people. Reputation. Some customers say it isn’t as potent as other multivitamins. If you’re a bodybuilder who wants to improve athletic performance and boost long-term health, Universal Nutrition Uni-Vite is up to the task. However, it’s not the best athlete multivitamin on the market. Plain and simple. We recommend you at least give this one a shot. If you like it, buy it. If you’re keen on getting an all-natural alternative, there are heaps of other multivitamins to choose from.